Hi everyone!! I am so excited to show you the newest fall collection from KBShimmer today!! You Autumn Know is a crisp white crelly loaded with multi-sized hexes and micro slices in orange, gold, and fuchsia. The formula was smooth and easy to apply, and the glitters spread out evenly across the nail. I really like this one a lot! It has such a great crunchy leaf feel to it, but the fuchsia also gives it a Halloween feel to it too! 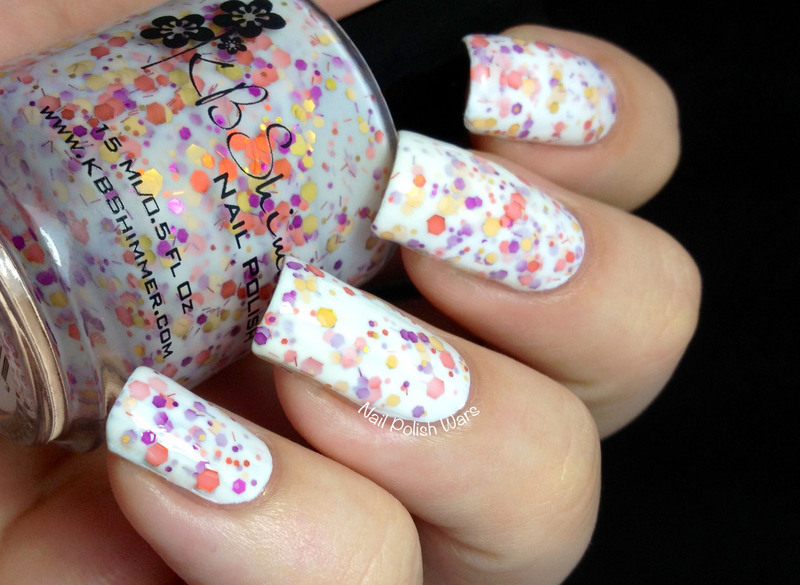 Shown is two coats of You Autumn Know over a white base. 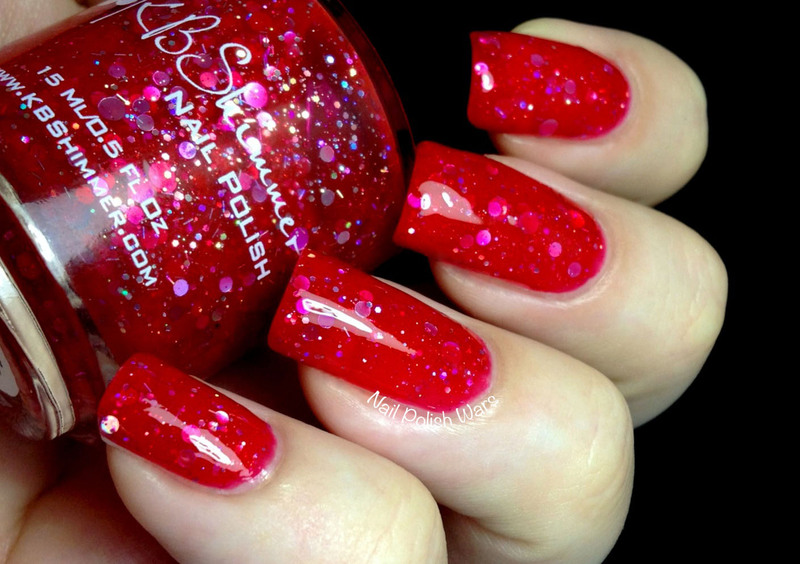 Vicious Circles is a bright red jelly loaded with multi-sized silver holographic dots and hexes, as well as micro slices. The formula was smooth and easy to apply, and it was also surprisingly opaque for a jelly. 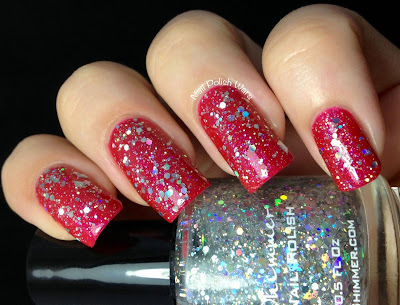 I really love the way the red jelly gives the silver glitters a cherry look! Shown is two coats of Vicious Circles. Excuse Me, I Blurpled is a deep indigo jelly with multi-sized hexes in bold blue, purple, and flecks of copper. The formula was a tiny bit on the thick side for a jelly, but was still easy to work with. 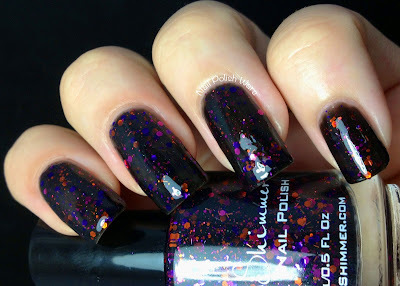 I love how deep this shade is, and the way that the glitters are more of an accent than the front runner!! Shown is two coats of Excuse Me, I Blurpled. Turbulence is a slate grey matte loaded with small silver flakes and flecks of fuchsia and blue. The formula was smooth and easy to apply. This is such a stunning shade! 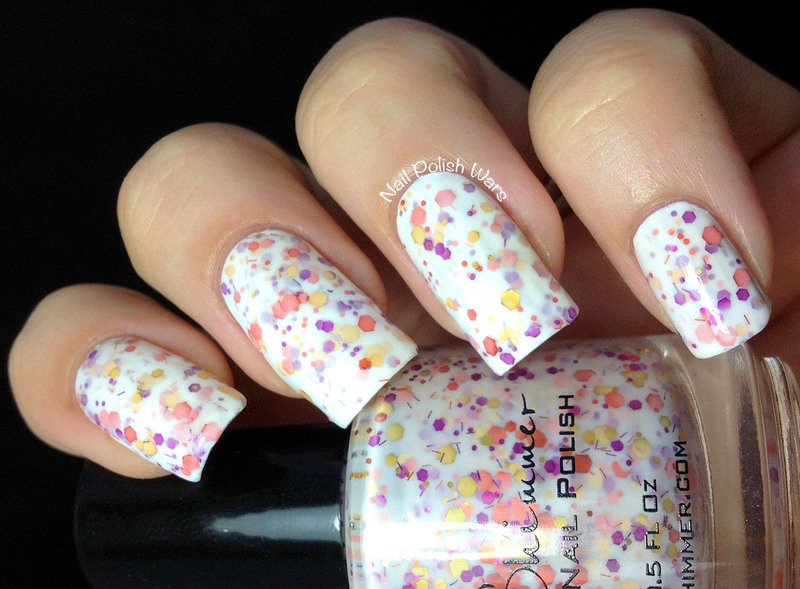 I am crazy about the delicate flakes here!! Shown above is two coats of Turbulence with no top coat. Shown below is two coats of Turbulence with KBShimmer Clearly on Top top coat. You Go Ghoul! is a black jelly loaded with multi-sized hexes in purple, magenta, and orange. The formula was smooth and relatively easy to apply. I did have a little trouble with glitter dragging, so you might want to wait for a couple of minutes in between coats. Shown is two coats of You Go Ghoul! 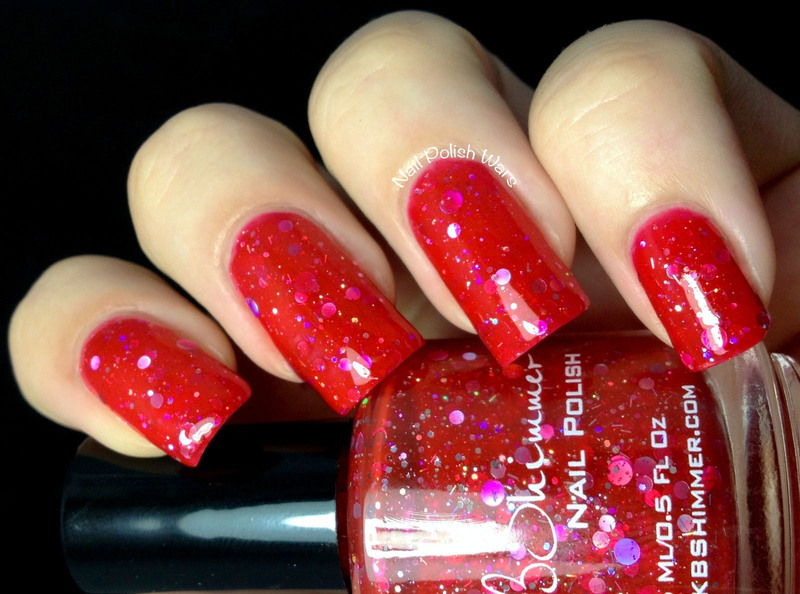 Every Nook & Cranberry is a matte cranberry with a subtle mix of gold and bright pink flecks. The formula was rich and easy to apply. I am absolutely crazy about this one! 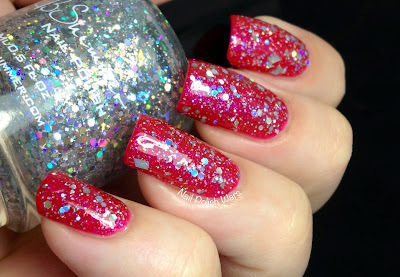 The subtle shimmer it has is amazing, and the pink flecks shine electric in the light! Shown above is two coats of Every Nook & Cranberry with no top coat. Shown below is two coats of Every Nook & Cranberry topped with KBShimmer Clearly on Top top coat. Teal Another Tail is a muted teal satin shimmer with a strong flash of pink that borders on the duo-chrome. The formula was smooth and easy to apply. This shade is not nearly as mattified as the others in this collection, as you can see in the photos. In actuality, the satin finish was much more easily visible in person. I also noticed that the addition of a top coat did dull the pink flash a teeny bit. Shown above is two coats of Teal Another Tail with no top coat. Shown below is two coats of Teal Another Tail topped with KBShimmer Clearly on Top top coat. Ice Queen, which is actually not a part of the fall collection, is a clear coat loaded with multi-sized silver holographic hexes and diamonds. The formula was easy to apply and the glitters spread out across the nail evenly. This makes such a dazzling accent to any base color. I love it!! I had a feeling it would look great over this gorgeous cranberry, and I was right!!! 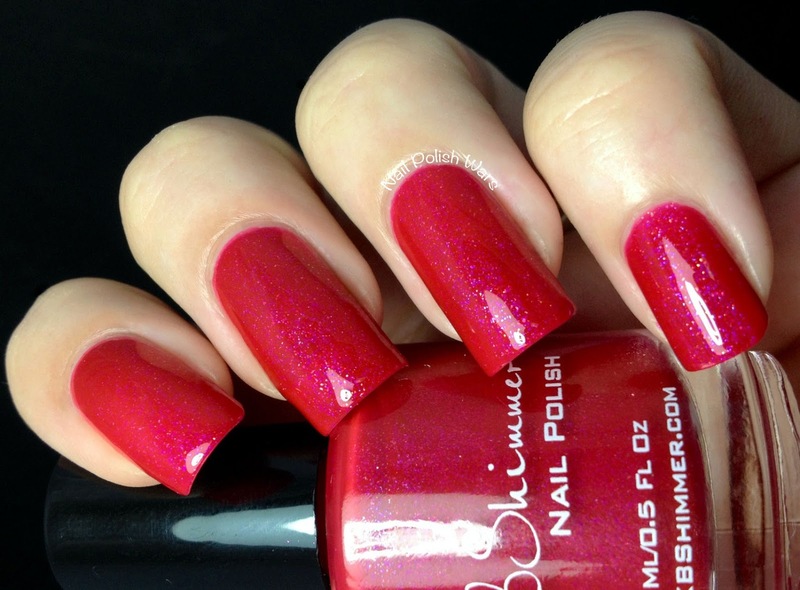 Shown is one coat of Ice Queen over Every Nook & Cranberry. Overall, I'm super psyched about this collection! There's so many awesome fall inspirations, but then there are also some great ones to take you into winter as well!! 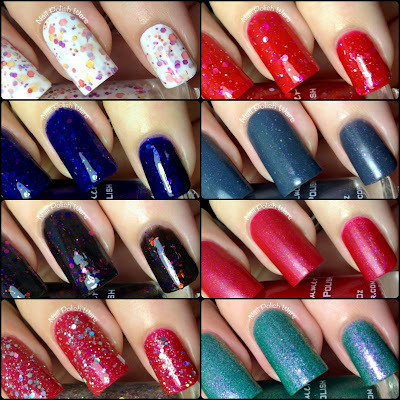 The KBShimmer Fall Collection will be released on September 1st, so be sure to stop by their storefront here to snag your own!! What an awesome collection! 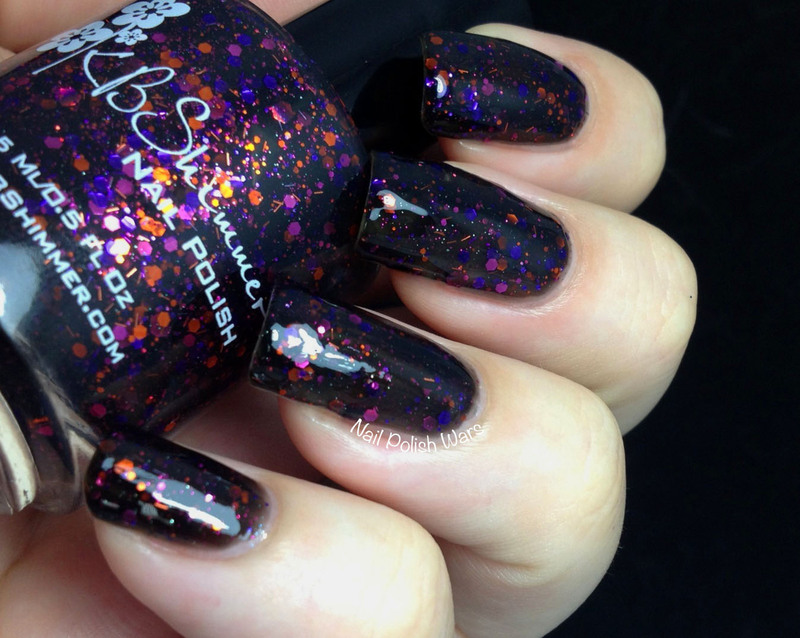 I really love Vicious Circles, so pretty. Maybe follow each other on bloglovin? Let me know follow you then back. Ugh, these are so gorgeous! I want several!